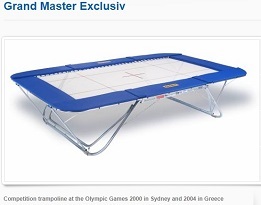 Richards Trampoline Club has 2 Eurotramps, both Grand Master Exclusiv with 4mm x 6mm beds and lifting roller stands, for sale. They have been regularly serviced by Carl Furrer and the asking price is £1,600 each. Buyer collects from a location in East Bedfordshire. For more information please contact Kyrstin directly on kyrstin@ntlworld.com.